This is the list of apps that I use to run businesses, help others set up and optimize theirs, and manage day to day life. If you want to get started or see some improvement quickly, read this article and then grab the (free) apps listed and use them as described. If you want to customize it, then go ahead! The goal of this “cheat sheet” is to let you quickly see what apps can most productively start working for you right now in a few major areas. 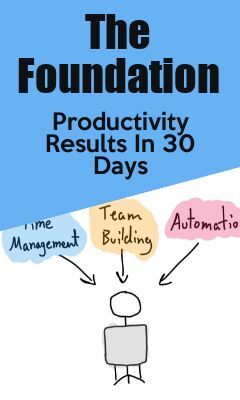 This is the app that is going to be your default for catching all those odds and ends that you have and in some cases can be a multi-tool in your productivity arsenal. Evernote is hugely powerful, but the reason we should be using it is the flexibility and ability to capture nearly any type of input. From doodles and graphs, to full written docs, audio, and more, Evernote can do it all. Your notebook. If you’re not digitally inclined, using a notebook can sometimes perform this function, but I find that it’s just not the same – with Evernote able to capture pictures, business cards, search PDFs, and more, I push for entrepreneurs to have a solid digital “catch all” so they always have their bases covered. So, what to do? If you like or want a notebook, use it in conjunction with Evernote. As you go through your day, add any thoughts, tasks, or ideas to your catch all. Don’t try and remember it all or write them down in random locations. This is best done in conjunction with a few notebooks and tags. There are entire courses on this – don’t overthink it, just get it set up. Start with an “inbox” notebook where everything goes to begin with, and add a “reference” or “storage” notebook for long term storage, and maybe a few notebooks for active projects. You can do the same with tags. Here’s a quick guide to getting started if you’re not familiar with Evernote. Now it gets interesting, there’s a mind boggling huge number of To Do List apps out there. So, let’s narrow the field down to the top 3. Todoist has a long history, is intuitive, is cross platform, and has great widgets for quickly entering data. Focuster has an iOS app and a good web interface for us Android fans. The power in Focuster lies in the two way calendar sync. 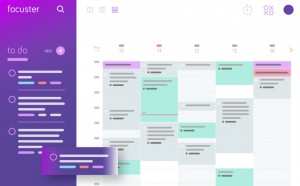 This means it takes your task list and finds the first available spot in your calendar where it books that task – and shows in your calendar so that other apps or appointments don’t try to schedule over it. Pretty awesome! Last but not least, the paper and pen route has a strong following for To Do Lists, and I’ll just say that just like having a “catch all” you should combine this with a digital method where possible. That doesn’t mean having 2 To Do Lists, just that you will want to use a “catch all” like Evernote along with your pen and paper To Do Lists. Somewhat similar to your “catch all” you can use this to quickly get ideas out of your head…but a word of warning – only use one or the other for long term storage. This will be the place where you arrange your daily tasks lists, prioritize, and batch (more on that later in the article). If you work with a team you might want to consider having a shared project so that you can quickly assign tasks or notes to someone else. If you choose to go with Todoist you can check out the free Todoist Powerup training here. Here’s where you can combine two apps into one. If you’ve chosen to use Focuster as your To Do List, you now ALSO have a time tracking ability built into the service. However, if you’re using Todoist or pen and paper, you’ll want to go another route. For this, you should use the Best Self Journal. Not only will you get the benefits of time tracking and planning, but you’ll also be building some additional great productivity, time management, and project planning training. If you haven’t heard of the Best Self Journal yet or want to know more, you can see my Best Self videos right here. If you’re wanting to get started today and can’t wait for them to ship it to you, pick up the PDF copy right here, print out a sheet and start time tracking today: https://productivity.academy/bestselfpdf – pretty nice of them, although once you order one you won’t go back! Track your time for 1 day. Yes, just 1 day. It’s going to be harder than you think it is, I guarantee it. I also guarantee that after you do this for 24 hours you’ll have so many ideas on how to be more productive and save time you won’t need this article anymore….wait, no, come back! Just kidding – a little. Seriously, track your time for 1-3 days and see what patterns pop up. Are there times you start wandering? Are you planning tasks or meetings during times you shouldn’t be? Set a reminder to review your time tracking notes after your 1-3 days (give yourself at least 30-60 minutes) and write down what you notice. Then, write down what you can change starting now to make 1 improvement. I don’t have a hard set schedule for this, but until you get a better grip on where your time actually goes, I would suggest every 90 days. And, in case you’re wondering, I don’t schedule my time to the minute. Or 15 minutes. I also don’t work 8 hours a day. If you can become truly in charge of your time and output, you can get more done in 3-4 hours than most people do in 1 or 2 days. Trello. Hopefully you’ve heard of this powerhouse by now. If not, get ready for a great surprise. As an entrepreneur Trello is a surprisingly flexible tool that can handle many tasks, but the one that it really shines at is handling workflows for projects and employees – and it can be done for free. You can create “cards” and assign them to your employees who will be notified. They can then do the task(s) needed and move the card to the correct list. Do they have a question or are stuck? Click and move it to the “need help” list and you’ll be notified. There’s a lot more that you can do with Trello, but using it for task and project management with a team is where it shines – as you use it more you’ll see additional uses for Trello in your organization. So much easier to just show this one – so I made a video outlining how to set up a board for VA’s. You can adapt as needed. Click here to watch it. Trust me, we’ve all been there! So, what we need to do is bring these apps into a single framework that lets us control and use the apps in the best way possible – letting us focus, get more done, and…surprise, be more productive! The name of the game is daily review. Your daily review is what will tame any app and make it do more for you. Here’s the general outline. Look through each of your apps / tools for tasks, action items, and loose ends. What’s the single most important project or task today? What’s the next most important? This can be a transformative addition to your life. Seriously. And it’s something that you can start doing in as little as 10 or 15 minutes per day. These are SOME of the things that I teach in my Guidebook “The Entrepreneurs Productivity Handbook”. Not ready for that? No problem, just grab the apps that I outlined in the cheat sheet and start putting them to use. Before we part ways, I want to share with you the rocket fuel that you can add to this if you’re ready for it is the time and methods for reviewing your daily review and other processes. It’s something that so few people are willing to do, but what separates the good from the great.